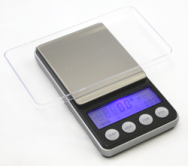 The DW-D series pocket scales from DigiWeigh are super small yet packed with useful units and features. These scales come standard with seven different weighing units and can also count pieces by weight. Grams are always shown and other units will display in unison with the gram weight, great for unit conversion! The auto check function will display remaining battery power on the backlit LCD display. The clear plastic cover not only protects the scale, but can also be used as a handy tray to hold loose pieces for weighing.